Yesterday, we learned of the shooting deaths of four people, including an innocent toddler. Just look at the perpetrator: Neo-Nazi and Minutemen Militia member JT Ready (who also took his own life) and you’ll see an ugly side of America: intolerance and militant vigilantism at its worst. J.T. 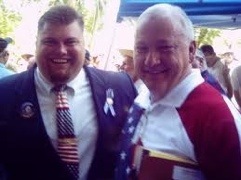 Ready was a candidate for Pinal County Sheriff and a longtime associate of ex-State Senator Russell Pearce. Pearce was the genius behind SB 1070. The bill that permits law enforcement to basically pull someone over for looking like an immigrant. Just a tad bit racist, perhaps? 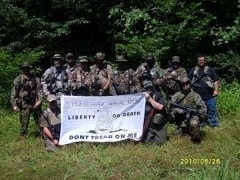 Groups like the Minutemen Militia (pictured here) popped up following the election of a black president with a funny name. Barack Hussein Obama won the White House and these folks lost their goddamned minds. They cling to their guns because they feel their 2nd Amendment rights are in jeopardy. Of course, gun rights have only gotten more lenient under President Obama. This is part of how the Teabagger movement gained traction. Yes, they called themselves Teabaggers until the homosexual implication of Teabagging was made evident to these chronic mis-spellers. In fact, upon the inception of the Tea Party, “freedom lovers” who are “Taxed Enough Already,” hate groups have been on the rise. Back in 2010 we had to accept white supremacy and hate groups can’t be wished away. Fox News and their minions try to lend legitimacy to these pissed-off people. Still, there’s so much anger out there, and many aren’t afraid to be downright blatant about their hate. Even after President Obama was instrumental in killing Osama Bin Laden, these people still distrust him and all “foreigners”. They don’t believe his birth certificate is real. Not once have we asked to see Mitt Romney’s. Just look at the JT Ready for Sheriff Facebook Fan Page and you’ll see the insane paranoia of these people. Even though illegal immigration has declined under the Obama Administration, these folks feel they need to take care of wayward Mexicans. Watch as this man Ready says he’ll kill all border crossers. Just what we need, unstable Americans heavily armed. In fact, the amount of ammunitions and chemicals found in Ready’s house was so significant, the Department of Defense and the FD Hazmat Unit was called in to remove it. Naturally, the GOP is going to distance themselves from such militant people, yet they kowtow to the NRA as if they’re holy. They’ve spent tons of money on their GOP enacting laws that increase gun violence in America. If you hear the terms “entitlement spending”, “Constitutional Conservative”, “Tea Party favorite”, “deficit hawk” (or a myriad of less offensive terms than white supremacist), you’ll realize you’re simply dealing with the racist Republican party. Their budgets skewed towards hurting poor and minorities show who these people are. JT Ready and his awful legacy is not as anomalous as we’d like to think. The guns and God crowd is firmly entrenched in the GOP and they’re going to try to win. The rest of the world sees how ridiculous these fringe lunatics are and I’m confident America will see that too this November.